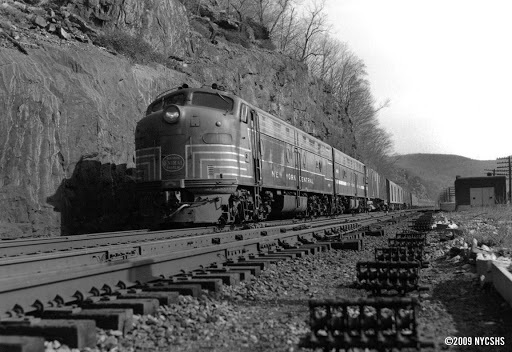 A few photos from along the scenic Hudson Division from the mid-1960s, taken by Robert K. LaPorte, from a private collection. Supplied by Bill Strassner. 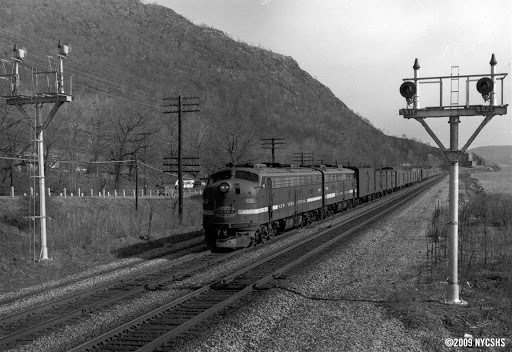 April 10, 1965, a New York Central train speeds northbound at Breakneck Ridge, splitting the masts at Milepost 55. Metro-North trains make limited stops here to pick up and drop off day hikers. 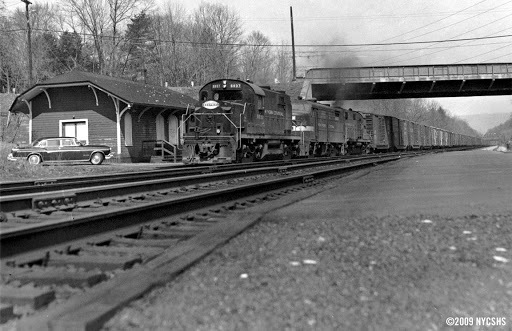 March 28, 1965, and eastbound freight with a dog’s breakfast of Alco power rumbles past the station at Montrose, New York. The photographer’s 1955 Chrysler Imperial is parked at the station! Metro-North closed this station, along with Montrose in 1995. May 2, 1965, New York Central train #15 (pulling Flexi-Vans in the consist) pass the site of East Garrison tower (note the pipeline carriers still in place).